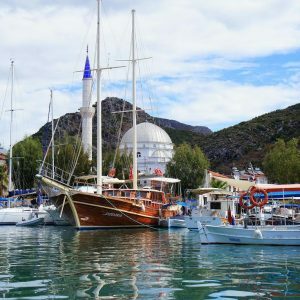 The Lycian shore of Turkey is not only famous for its archaeology and its stunning natural beauty, it is also rich in wildlife. Armed with cameras, notepads, a bird-spotting book and their parents, intrepid explorers Lucy (11) and Patrick (13), aboard the good ship SunWorld IX (a traditional Turkish gulet), set off on a seven-day mission to boldly go where no school children have gone before, namely to travel along the western Lycian Shore. 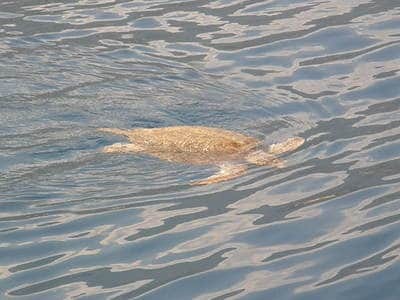 Early in their tour, when our gulet was anchored off Kaş, our travellers made a rare sighting of a large Loggerhead Sea Turtle (caretta caretta). The turtle, which measured about a metre (3.3ft) in length, surfaced close to the boat at regular intervals to take air and then return to the depths to carry on feeding. A few days later, Lucy and Patrick saw the beach at Patara where these endangered creatures lay their eggs in the warm sand. Eighty days later, after hatching in the dark of night, the baby turtles follow the reflection of the moon on the sea to find their way to the water. 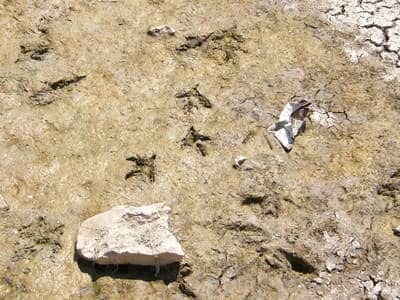 What dreadful monster could have left these tracks at Patara? 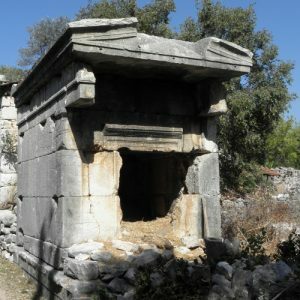 Whilst exploring the nearby archaeological ruins of the ancient city of Patara, a white-and-black bird with long red legs and a distinctive call flew out of the swamps that used to be the city’s harbour. It circled overhead for a few moments and then disappeared back into the reeds from which it had appeared. Consultation with dad and the bird-spotting book confirmed to our young explorers that this was indeed an unusual sighting of a Banded Stilt (himantopus himantopus). 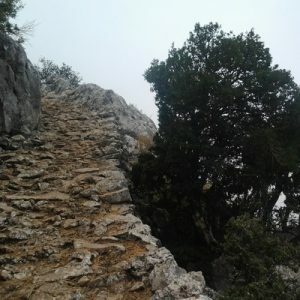 However, discussion over dinner about what had made the enigmatic large foot prints in the mud on the road leading to the ancient Roman lighthouse continued late into the night – the issue remains a mystery. On the last day of their mission, however, came the most exciting discovery of all. Emerging silently from the darkest recesses of the Bay of Fethiye, there came into sight a fearsome creature of the deep. 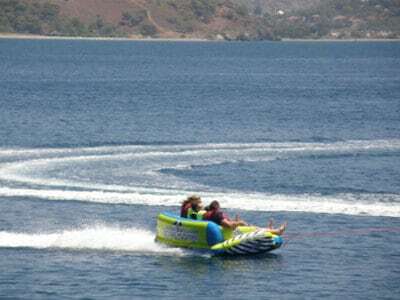 Measuring nearly five metres (16.5) in length and a vivid yellow in colour, our young explorers found themselves confronted by a terrifying sea creature – the dreaded Fethiye Banana Boat (bananus giganticus inflatabulus macrii), scourge of the Lycian Shore! There was only one thing for it: Lucy and Patrick bravely jumped onto its back, as the creature thrashed about in a desperate attempt to throw them off. Our young explorers hung on for as long as they could, knowing that no one would believe their tales unless the creature could be captured and put into a museum for the benefit of science. Sadly, after ten minutes of valiant but exhausting struggle, during which the air was torn by the blood-curdling screams of children (mostly, it has to be said, coming from their expert guide) they had to relinquish their quarry, which slunk off back into the deep waters of the Bay. Maybe it was wrong of them to try and capture such a noble creature of the wild; to attempt to tame an elemental force of nature. Maybe there must always be limits placed upon human knowledge in order to remind us of our smallness and frailty in the face of Nature. Maybe such failure is a wholesome reminder, illustrating the vanity of human conceit. Or maybe, in years to come, others will succeed where they failed…. Excited? 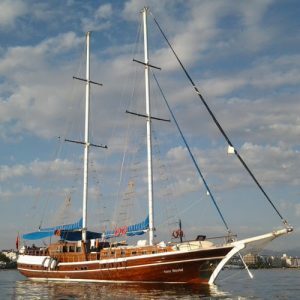 You may find yourself exploring similar wonders and mysteries on many of our escorted tours and gulet cruises – including on our family tours!